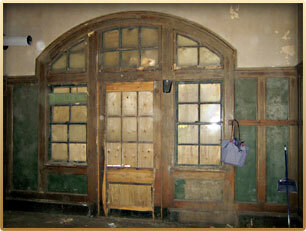 The station you see today is essentially the station that was built in 1914. 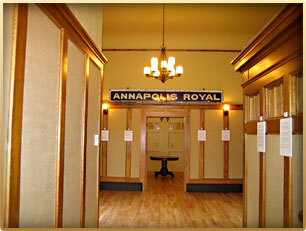 At that time, it comprised two waiting rooms — one for men and one for ladies — each with its accompanying washroom. 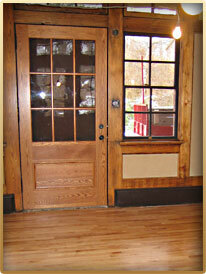 Between the two were a hall and the stationmaster’s office, facing the train tracks. 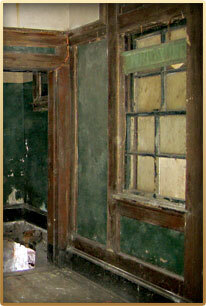 A large luggage room, accessible from the outside only, was located next to the ladies’ waiting room. The only structural changes I made to the original design were the transformation of the gentlemen’s washroom into a small kitchen and the insertion of an interior door into the original luggage room. 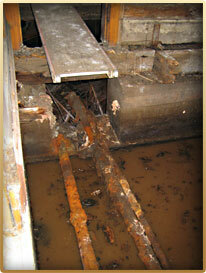 It is a tribute to the workmanship of the time that so much could be saved by today’s craftsmen. The hardware on the sliding doors of the luggage room, the ticket window’s brass grille, the radiators in the two waiting rooms, the beautiful oak woodwork, the stationmaster’s office desk, the lovely old windows… all are original. 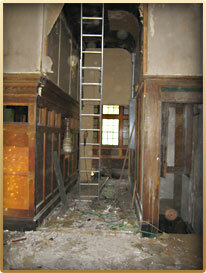 Here’s a tour of the project in two sections, showing the building elements and rooms before and after restoration. 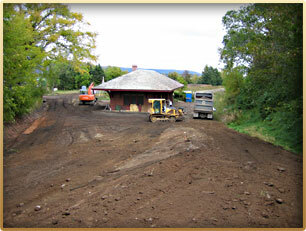 The train station was originally built on low land and had been flooded for years by the time I bought it. 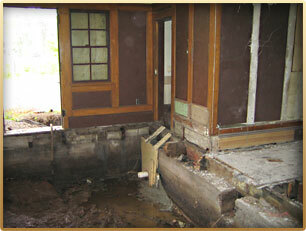 So the very first thing to do was control the water on the property. 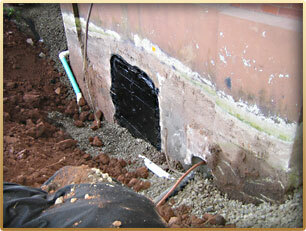 This meant re-contouring the land around the station and installing French drains. We dug the silt out of the basement under the stationmaster’s office, routing new pipes through its sealed concrete foundation. 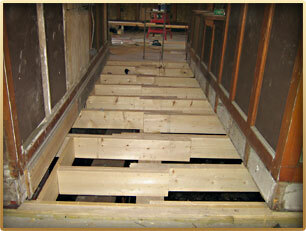 Next, we had to remove the rotten floors, sills, joists and supporting beams in all the rooms. It was a filthy job. The second chore was taking out the partitions that had been installed over the years as the ladies’ waiting room and stationmaster’s hall had been closed off to lower heating costs, and the luggage room had been converted to a workshop. 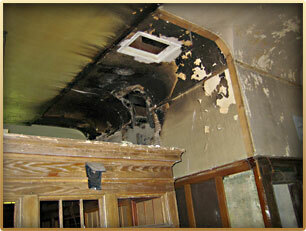 Luckily, apart from damage to the hall from a small fire in the 90s, the rooms were in original condition. 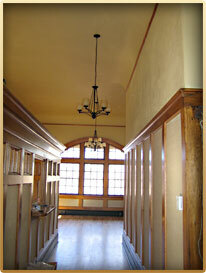 One of the most significant characteristics of the station’s Arts and Crafts design is its rounded windows, which flood the building with light. 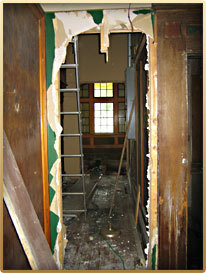 Reclaiming their interior oak woodwork was paramount. It was stained and water-damaged, but responded beautifully to restoration. 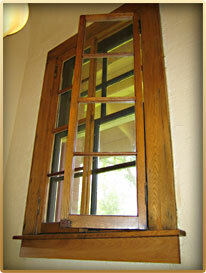 The windows had been covered for many years; we were astonished to find many of the original glass panes still intact. Some of the interior sull sash windows (a kind of “storm window” on the inside) were missing; I had those replicated by an area craftsman. 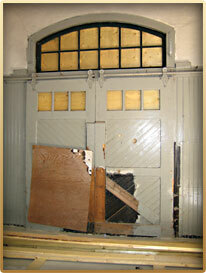 Only one of the four original entry/exit doors still existed, and it was too far gone to save, except as an architectural model for the four new ones we made out of solid oak. 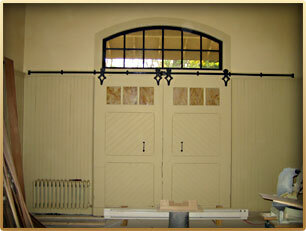 One set of the luggage room doors was intact; we replicated them to replace the other set. 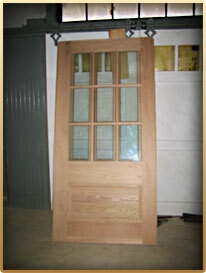 The sliding door hardware, however, was still as good as the day it was made. It only needed a new coat of paint. 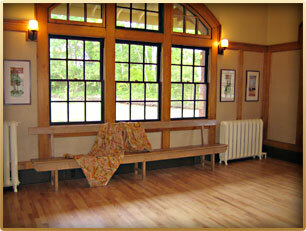 The station waiting room and hall walls are distinctive in that they were divided into panels framed by oak boards and originally filled with green burlap, a simple open weave fabric much used in the construction of other DAR/CPR train stations. Painted different colours over the years, the burlap inserts had rotted, but the plaster beneath was in good condition and I was able to save it. 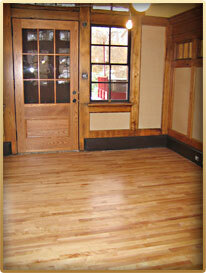 The oak paneling had never been painted, so it was simply restored. I did make a “non-restoration” decision to replace the green burlap with honey-coloured burlap for a lighter overall look. 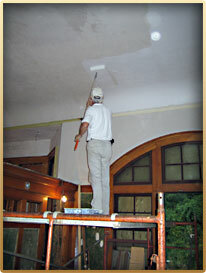 The high coved ceilings are an architectural signature of Arts and Crafts design. 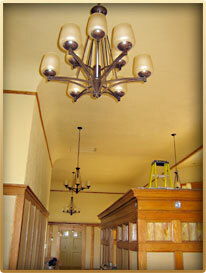 They were originally finished in rough plaster, with an oak band detail, and this was replicated in the repaired areas. 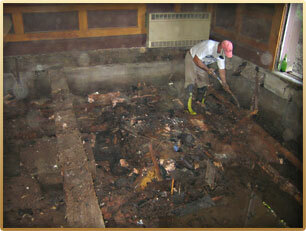 It took days of backbreaking labour to scrape off and then replace the charred plaster in the hall. The floors were unsalvageable due to water damage, so they were torn out and replaced with the same Number Two grade birch as had originally been used.